Beauty comes from the inside and skin has been reported to reflect the general inner-health status and aging. 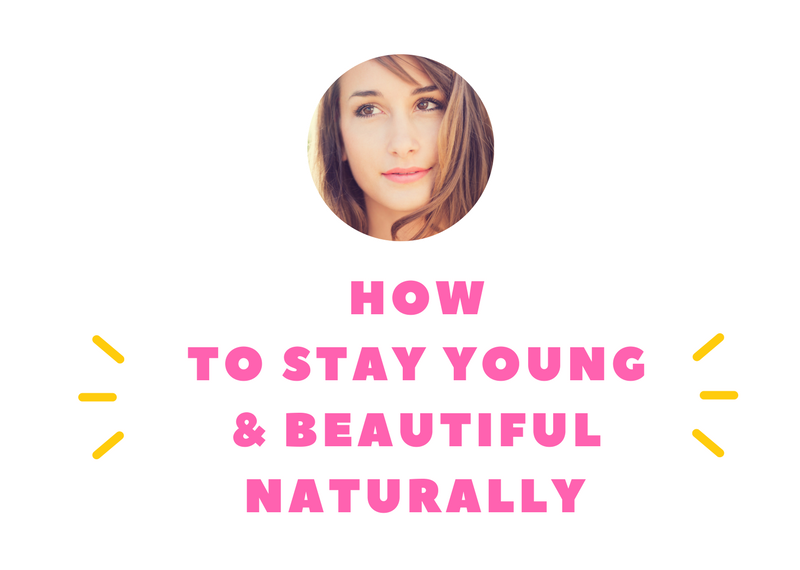 Here is some practical advice how to stay in good health and look young and beautiful naturally. Did you know that one of the most important factors in anti-aging and longevity is nutrition? Try to avoid diets poor in nutrients e.g. extreme weight reduction diets – they may cause dehydration, malnutrition, skin problems, hair & nail loss and increased susceptibility to infections. Conversely, eating a healthy nutritious diet can improve and maintain a healthy skin and prevent hair and nail loss. Try to eat more fish rich in omega-3 fatty acids, such as salmon and mackerel, and even consider good quality fish-oil supplements . Did you know that lack of sleep can be a major cause of stress? Stress not only has a negative effect on your overall health, but also causes a chemical response in your body that makes skin more sensitive and reactive. It can also make it harder for skin problems to heal. Do you regularly consume foods and drinks rich in refined sugars? Foods that contain refined sugars make your blood sugar soar quickly destabilizing it altogether. This triggers your body to make a burst of the hormone insulin to help your cells absorb the sugar. A good way to improve the health of your skin is to eat in a manner that keeps your blood sugar steady. Continuous UV exposure leads to a damage of the DNA of our skin cells. UV is the major cause of pigmentation, texture changes, thickening and thinning of the skin, blood vessel changes, the appearance of telangiectasia, moles and skin cancer. Although offering some protection, sunscreen alone is not enough. If your skin is not getting the sufficient amount of water, it will turn dry, tight and flaky. Dry skin has less resilience and is more prone to wrinkling. As water is lost in large quantities every day, you need to replace it somehow. The unfortunate truth about drinking water and skin is that water will reach all the other organs before it reaches the skin. Drinking lots of water can keep your skin hydrated and looking radiant. Besides drinking lots of water, you should add more fruits and vegetables to your diet. Nicotine constricts the small blood vessels and decreases the flow of oxygen and nutrients to the epidermis. Smoking is one of the main causes of wrinkles, especially around the mouth. Nicotine stains the skin and also increases the time that it takes for the skin to recover from wounds. Heavy drinking may cause dilation of the tiny blood vessels in the face, which can lead to a permanent network of reddish capillaries. Remember, heavy drinking affects all organs of your body including your skin. Exercising increases circulation and aids the distribution of nutrients and oxygen to the skin. Sweating also helps you to release the dirt from your skin resulting in a healthy glow. The cold and windy conditions of winter often result in itchy, dry skin. Skin responds by increasing oil production to compensate for the weather’s drying effects. A good moisturizer will help ease symptoms of dry skin. Dry and itchy skin requires deep hydration and what better than natural oils to do the trick. Many oils including coconut oil, jojoba and lavender oil are great natural moisturizers with excellent soothing effects for your skin. Want to transform yourself into a healthier, happier person? Discover the life-changing power of nutrition. You easily reach and maintain (without starving) a healthy weight because your metabolism is functioning at its optimal level. You no longer feel like being run over by a truck - your supercharged thriving body is in excellent shape and your mood, energy and performance are steady throughout the day. You know exactly what to change in your diet and lifestyle in order to beat daily stress and anxiety, and sleep more soundly each night. You have access to insider secrets that help you keep a healthy low carb diet that is rich in vitamins and minerals known to control blood sugar fluctuations. You daily menu is rich in highly nutritious foods that provide omega 3 fatty acids, fibre and vitamin C - all needed to keep your bad cholesterol and triglycerides in check. Get fit and healthy in three simple steps: Select, Assess and Adjust. © Copyright 2019 All rights reserved Inlivo Blog. Copyright © 2014 Inlivo.com. All Rights Reserved by Inlivo and its data providers. All marks, brands and names belong to the respective companies and manufacturers and are used solely to identify the companies and products.